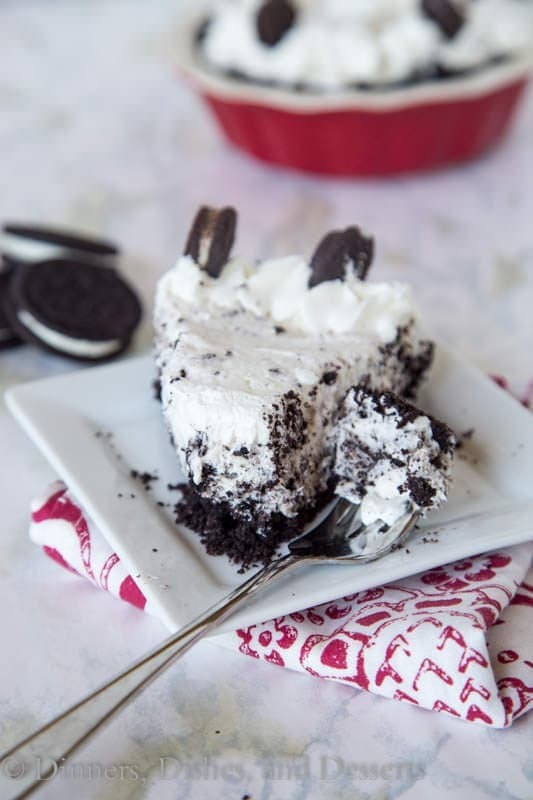 Oreo Poke Cake – An easy chocolate cake topped with an Oreo pudding and whipped cream mixture. 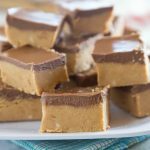 Light, creamy, and so good! What is with May? April went by so fast, and now May is going by even faster. All the last minute school activities, planning for summer, getting ready for graduation (yes 5th grade graduation is a thing) and so much more! We have family coming at the end of the month, I am co-hosting a blogger get together this week, and it was just Mother’s Day. Seriously, how do you make time slow down, so you don’t miss anything?! Are you getting ready for summer at your house? I try not to turn to oven on too much during the summer for baking. 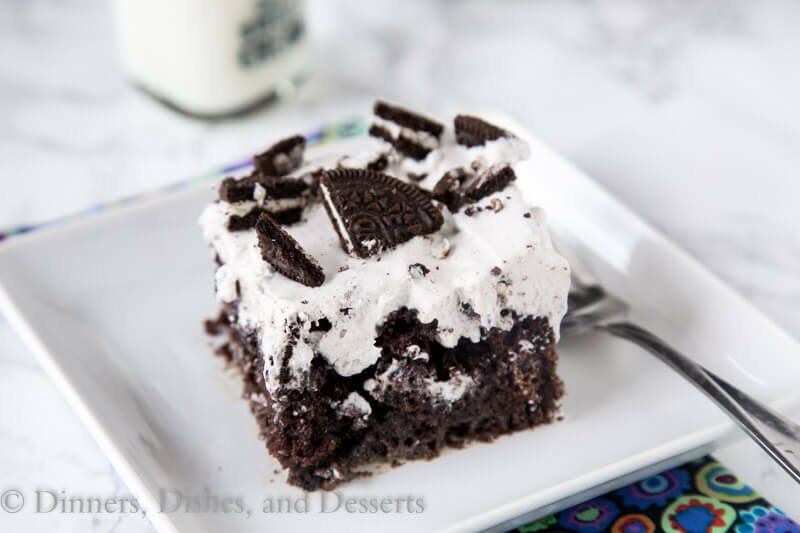 But this Oreo Poke Cake is going to be the exception. 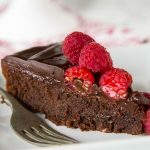 It is so easy to put together, and topped with a light and creamy pudding/whipped cream mixture, you don’t feel like you are eating a heavy cake. 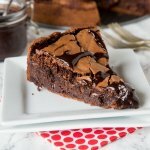 No Bake Kool-Aid Pie is a favorite no bake dessert, but sometimes you just want chocolate. Chocolate cake with chocolate frosting is probably my favorite cake ever, but this might be a close 2nd. I made a video (scroll down to see it) to show you just how easy a poke cake can be. 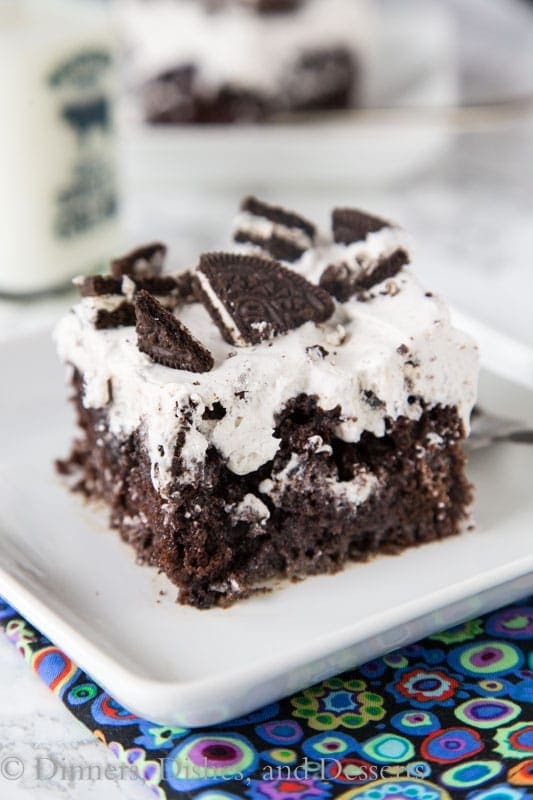 For this Oreo poke cake, you just prepare the cake batter like you normally would. Then I topped with crushed Oreo’s before baking! 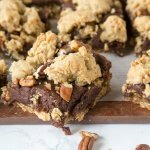 I love using Oreo’s as a crust, like this No Bake Mint Chocolate Chip Pie, but as a topping might be even better! I use the back of a wooden spoon to make the wholes in the cake, but you can use a knife, tooth picks, whatever you have. Just poke a bunch of holes, and then pour over the sweetened condensed milk. 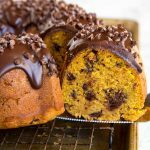 It oozes into the holes of the cake, and makes the cake so moist and delicious. Then mix pudding and cool whip (you can use homemade whipped cream if you want) together and frost. Of course I topped with more Oreo’s, because why not. 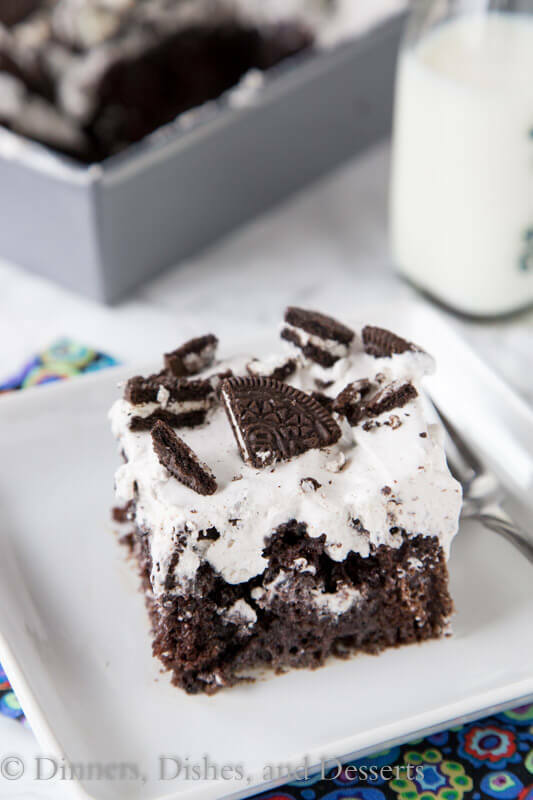 Oreo poke cake is great to bring to a party, or just have in your fridge for when cravings strike. It is a big hit with everyone, and only takes minutes to throw together! 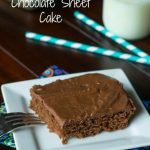 Even my husband who doesn’t like chocolate ate this cake, so creamy and light and great for any time of year! 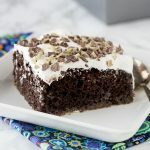 If Oreo’s aren’t your think you could try Mint Chocolate Poke Cake instead. 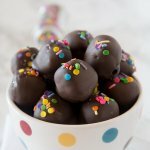 Hand Mixer: I love these for small batches or quick and easy recipes that don’t require a lot of ingredients. I love that you can have so many color options now, I love personally love the red! 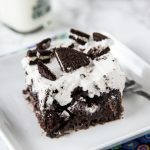 Oreo Poke Cake - An easy chocolate cake topped with an Oreo pudding and whipped cream mixture. Light, creamy, and so good! Preheat oven to 350 degrees. Spray a 9x13 inch baking dish with non-stick spray, or grease. Set aside. Prepare cake batter according to the package instructions. Pour into prepared baking dish. Crush 1 row of Oreo cookies, and sprinkle over the cake batter. Bake for 25-30 minutes, until cake is done and a tester comes out clean. Let cool for 30 minutes. Using the handle of a wooden spoon, poke holes (about every 2 inches), over the cake. 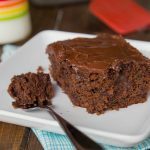 Pour sweetened condensed milk over the cake, using a spatula to spread evenly. Let cake cool completely, about 2 hours. In a large bowl whisk together pudding mix and milk for 2 minutes. Let stand for 3 minutes. Fold in cool whip. Spread over the cake. Coarsely chop 1 row of Oreo cookies. Sprinkle evenly over the cake. Place in fridge and let set for at least 1 hour before serving. 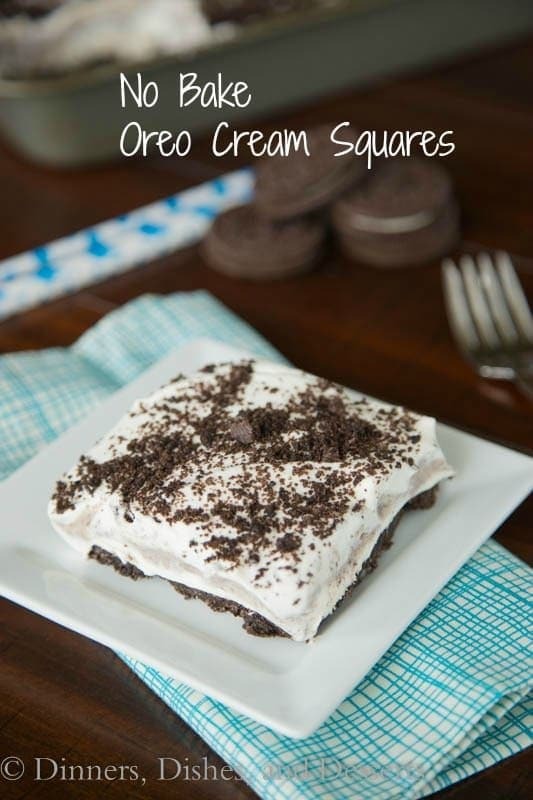 Want more Oreo dessert recipes? Mmmmmm I could eat the whole pan!! 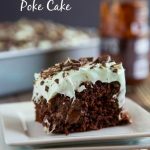 Poke cakes are perfect for Summer and potlucks! Plus, Oreos! This is so easy to throw together and looks scrumptious! You’re right – May is just flying by. Make it slow down! This poke cake looks like the perfect thing to bring to any party. 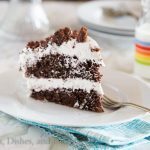 I’ve never made a poke cake, but I think I need to make this right now! 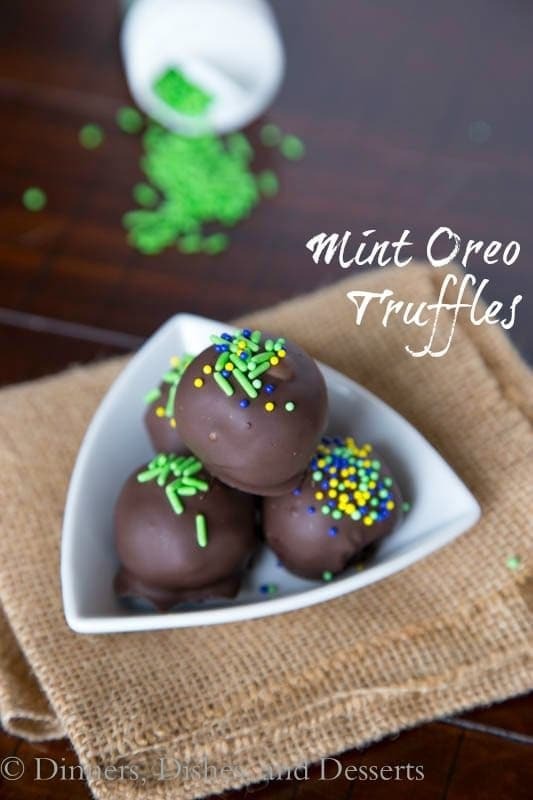 My 11 year old loves all things oreo so I am pinning to make this for his birthday! Great video! It looks so good!